With so many TV networks and streaming services now available, time is at a premium even within the two full weeks of the Television Critics Association conference. So even a juggernaut like HBO only commandeers a single Saturday morning at the TCAs, and was limited to five particular shows. Also premiering on October 9, Sarah Jessica Parker returns to familiar territory as Frances in Divorce: New York, nice dresses, and affairs of the heart. HBO describes the series as more of a half-hour drama than a comedy, as the story of a “very, very long Divorce.” The panel was TBD until the very last second, when Parker, series creator Sharon Horgan, writer Paul Simms, and Thomas Haden Church, who plays the soon-to-be ex-husband, walked onto the stage. Not present (presumably recovering from his recent Flight Of The Conchords tour) was Jemaine Clement, who portrays Frances’ rebound fling. Series producer Parker said that she was adamant about casting “a man, not a boy; an unexpected person,” and so succeeded in spectacular fashion. 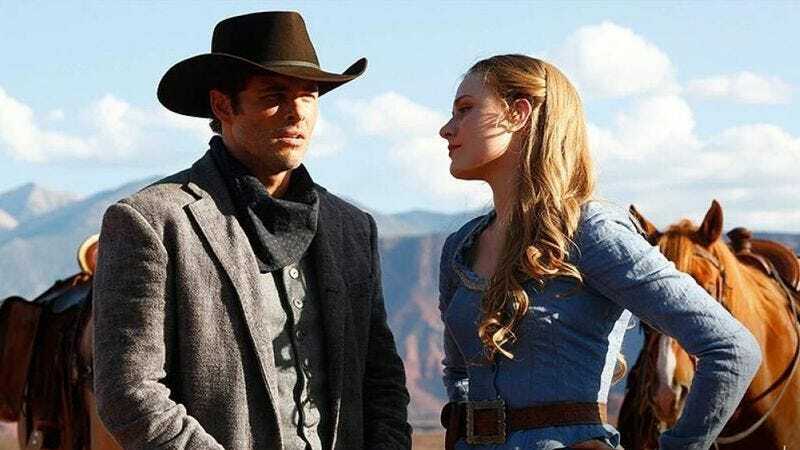 Nolan attempted to explain the show’s setting as a synthetic western set in the future, where “machines have been built to evoke emotion.” Unlike in the original movie, the new series starts with the point-of-view of “the hosts, and their limited understanding of what this world is.” Although various guests will drop into Westworld, “We didn’t do the Fantasy Island version of the show,” stressed Nolan. He was then asked if the “outside” world will appear, and chided, “Who’s to say there is an outside world?” Seeing as this rhetorical question was lobbed at journalists on day four of a 24-7 stay at the Beverly Hilton, the possibility of an outside landscape did appear somewhat remote.